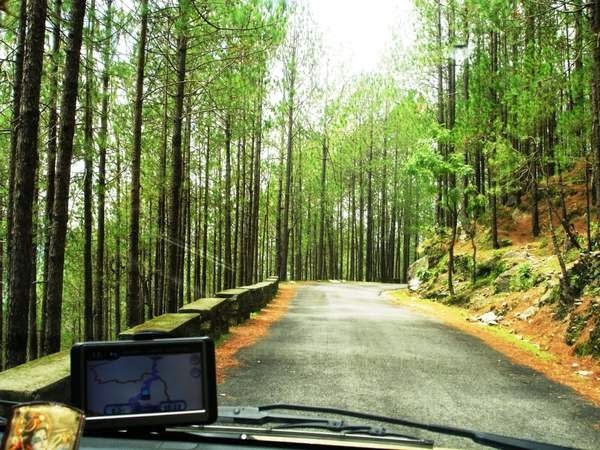 We started off to Lansdowne, a picturesque hill station in Uttarakhand, on 2ndApril (Good Friday). We were four families, all in their own cars. Four hours later, just before Najibabad, on a good empty road we were cruising merrily at 90kmph with my husband at the wheel. I was half-asleep enjoying the music and heard my husband curse, honk and brake. Startled, I opened my eyes and saw a three people on a motorbike, cutting across the road just twenty meters ahead. The tires screeched on the road and I braced myself for a collision, both hands on the dashboard and heart beating madly. The car hit the motorbike before coming to a halt. In that one second, in slow motion, I can still remember one of them flying off the motorbike onto the bonnet and windscreen before rolling off on the road and the other two sprawled on the road – one of them bleeding and motionless for what seemed an eternity before showing signs of being alive. I called one of our friends and they drove back to accident scene. The windscreen had cracked but was intact and a crowd had started building up. Someone suggested that we take them to a hospital a few kilometer away at Najijabad. Even though we were shocked, we bundled two of them in the car and the third one followed on the bike.Our friend and his family were an unshakable support and helped us throughout the ordeal. The drive to the hospital took twenty minutes through a closed railway crossing and by-lanes of Najibabad. Two men lay, it appeared, dying on the backseat and bye-standers peeping in to see why the windscreen was smashed. I didn’t want anyone of them to stop breathing and in fact was keenly following their groans of ‘Allah… Allah’! Those twenty minutes were the longest twenty mintutes we had spent in our lives!! At the hospital, the accident victims were declared fine with no lasting damage. The wounded men (they were local labourers) and their families were very courteous and thankful to us since we didn’t run away and brought them to the hospital and paid for their treatment. As we waited, for the final X-ray report of the man who had fallen on the windscreen, a crowd of Muslims clad in white kurtas and net caps began to form in front of the hospital. I began to panic and called up one of my friend’s brother-in-law, who was in Police posted in Delhi. He assured me nothing would happen. And I heard someone to my right addressing me, “Madam, iin logon ne to apne aadmi bula liye hein, aap bhi bula lijiye.” (Madam these people have collected their well-wishers, you also call yours.) I ignored him. I was astounded at the virtual stranger, who had been listening to my phone conversation and was deliberately instigating me to gather a crowd of my own. For what? Did he realize I was a Hindu? What was his motive to talk to me and give that particular advice? If in my place there was someone else, would they have gathered their supporters? Is this how riots happen? A person looking to spread trouble, for what intent and end? 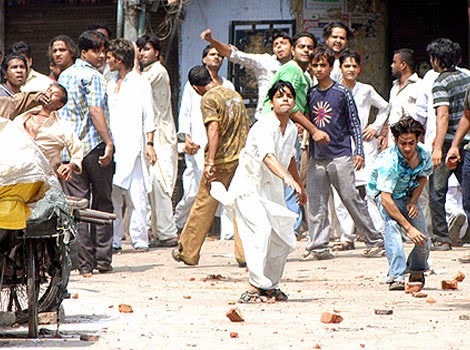 Were there these kind of people recruited just to find and incite unrest and chaos? These questions always rankle in my mind whenever I hear any news about riots in any part of the world. Disclaimer: The pictures are from google images.